Motorcycles: Can't ride anymore but still like them. We're greedy bastids on BARF, so keep 'em coming! Thanks, I was motivated to join this forum after seeing all the great old photos you posted. 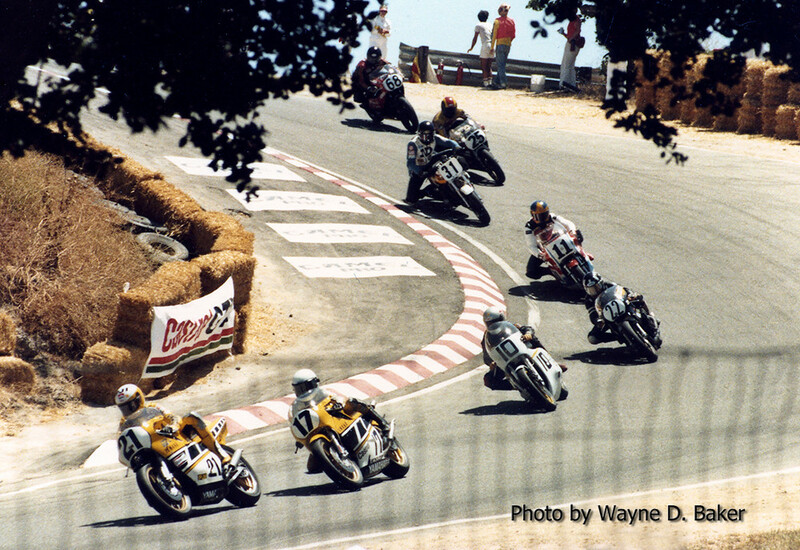 I went to Laguna once before the USGP races back in 1983 but I did not get all the great rider photos like you did. Here is Kel Carruthers pushing Kenny Roberts 680cc bike in 1983. Would you happen to have any of the sidecars? I don't think I took many sidecar pics, I will check through my old negatives. Here is another from 1983, Eddie Lawson in the corkscrew. Last edited by Wayneb; 06-08-2018 at 04:24 PM..
That would be greatly appreciated, thank you very much ! Everyone, say hello to my boss, Luis D'antin, riding like he means it. Thanks for putting these photos up Wayne, they're great! Sounds like you have a great job then, I just started reading your thread on your job, only 190 more pages to go. That picture is absolutely awesome. Circle Jerk in the Sink. I didnt realize they had aero hump leathers back in 93'...its cool to see how tech has evolved. I scanned a 3.5" x 5" photo for the Lawson corkscrew pic, I lost my 1983 negatives some how over the years. I lost a ton of negatives from superbike and endurance races at Riverside also. I don't think it would hold up well at 1920x1200. I looked through my negatives last night but I didn't find any sidecars, sorry. Here is Kenny Jr. on a 250cc from 1994. "High praise from Caesar" indeed! Thank you, but your shots are fantastic! You should contact Dean Adams at Supebike Planet ("Soup"), he loves running galleries of photos like this! Thanks, I kept buying better cameras and lenses to get better Quality, I was using a Canon A2E with a Sigma 70-210 APO f2.8 for most of my photos from the 93-94 races, I went to the Willow Springs motorcycle club races and practised panning so I wouldn't be so overwelmed by the speed of the GP bikes. I still took a whole bunch of photos that were not quite in focus or that I clipped one end of the bike or other off. Yup, same here, lotsa pics left in the photo store trash can... These kids today don't know how lucky they are with all their digital gizmos!